How to manage stress during a busy work period. 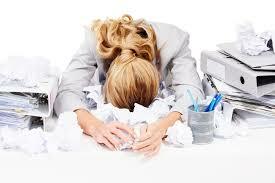 Everyone has busy periods at work, that can be stressful. You may not have control over your workload, but you do have control on how you manage your stress. Here are 4 ways to manage stress during a busy work period. Plan a break – If your work is such that you can predict when you would have a busy season, try to plan a break before or after the busy season hits. If you take a few days off before, you may be refreshed and ready to go through a tough workload. Or else take a vacation after your busy period to unwind. It is also important that you take breaks in between your day for meals. Simplify your life – When you’re busy with a large workload, avoid taking on additional projects and commitments. For example, taking on a DIY home project would not be a good idea, as it would stress you out further. Take care of your body – It is important that you are properly fuelled during a busy work period. Therefore, ensure that you have healthy food alternatives available at home and at work. Stay away from excess caffeine and sugary snacks for energy and opt for high fat alternatives like nuts, milk and fruit. A good workout can also help you reduce the stress from a busy work day. Find your flow – Understand how your body works and when you are most productive during the day. Some people are more productive during the early hours of the day, while others prefer to work late into the night.